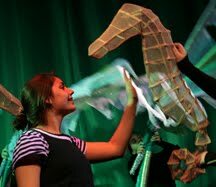 Luna's Sea is a 40 minute puppet, dance and blacklight show created by The Stringpullers Puppet Theater in collaboration with the Mystic Aquarium and Cornerstone Playhouse. Playing May 12 & 13 at the American Museum of Natural History, NYC. Swept up into a mysterious puppet theater on the beach, a child journeys deeper and deeper into the ocean. Guided by a gentle moon-puppeteer, she travels from the penguin shores of Africa through tides of elegant flying sting rays, to the dark underwater homelands of bioluminescent animals. Through the use of dance, puppetry, optical illusions, and black light theater, the audience is taken on a voyage of magic and wonder to discover that all life on earth is ultimately connected. "Fantastic Journey to the Depths"
I'm a contemplative visual and performing artist, keenly interested in chance connections and found objects; currently conducting a life experiment in following synchronicity. I gravitate towards anything that cultivates coincidence, and any place or event that is a crossroads of random people. I perform with The Stringpullers Puppet Company under the name Polly Sonic. Picture Window theme. Theme images by Naseko. Powered by Blogger.